Download Amazon Cloud Player app for ios & Android!!!! 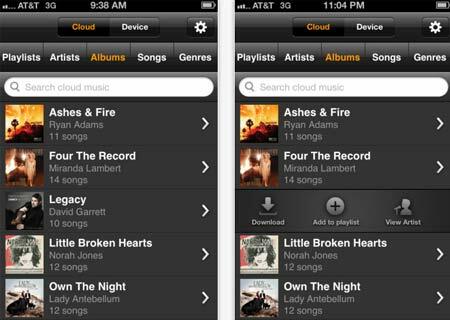 Amazon Cloud Player a “music streamer” app developed by Amazon is now available for iPhone & iPod touch. Tied with 2 services i.e. Amazon Cloud Drive & Amazon online Music store, its support music player on Cloud drive. Compatible with MP3s & Apple’s AAC files this app allows you to download music from Amazon accounts on your device. After downloading you can stream via Bluetooth, mange & create your play lists. You can also edit your play list & create album art. You can also apply repeat & shuffle mode to your play list. “By bringing Cloud Player to iPhone and iPod touch, we now have the most widely compatible cloud playback solution available, giving our customers the ability to buy once and enjoy their music everywhere.” Amazon said. Amazon service is best suited in situations when you have a small internal memory & killer data plan. After being Amazon customer you get 5 GB of free cloud storage & in case extra space is required you can use its paid service of 20 GB for $20/year & 50 GB for $50/year. Also there is another advantage for storage plan users i.e. they receive an unlimited space for MP3 & AAC (.m4A) for no extra charges but that will be limited time. What you prefer to buy a hard drive for extra memory usage (100 $) or Amazon apps??? Download Amazon Cloud storage for iTunes & Google Play store! !